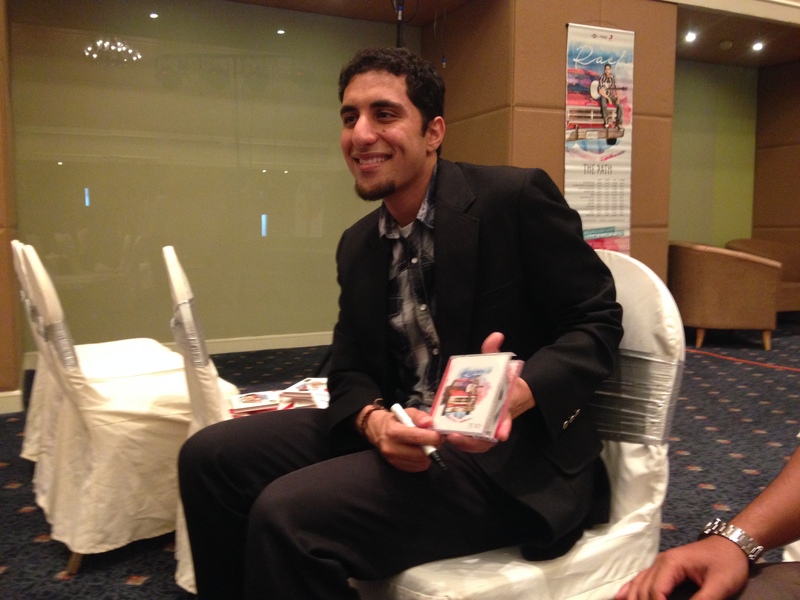 Raef, an emerging artist from Awakening Records, was here in Malaysia to promote his latest album, “The Path”. Jointly sold under Sony Music Malaysia and Inteam Records, “The Path” is a reflection of his journey in spreading the message of Islam and the Prophets in a cheerful and in catchy songs. Previously visited Malaysia as the opening act for Maher Zain, his third visit to Malaysia brings his musical journey to a whole new level. For Raef, his journey to Malaysia this time adds a whole new chapter in his life. Once as Awakening Records latest talent, introducing him along side Maher Zain, and giving him a chance to open for the big man himself. But this third trip to Malaysia, is of a different path: Raef, is officially launching his first debut album with Inteam Records and Awakening Records. A sense of accomplishment surrounding this young man. Clad in a comfortable coat, donning his sneaker shoes, and being true to himself, Raef entertained us with two of his song, one of it being “You are the One” and serenading us with his Islamic-infused songs, guiding us listeners to the Path, the path that leads us to Allah and to His blessings and Prophets. Given more time, he would have sang more. However, time was of the essence, as there was a need for a Q&A session, as well as several private interview sessions with various news stations and electronic medias. Munsyeed Dot Com managed to get an interview session with Raef, in which he showed his love for music, and most importantly, how music shaped his world, and the world around him. A calm and happy person, it was a joy to be his interviewer. The titles and the songs that you crafted in this album, would it be safe to say that it reflects your own views and passion? An autobiography perhaps? An autobiography, now that is an interesting way of putting it. I think I would say that it reflects my journey up until now. My musical journey and my journey through life and that’s the reason I call it “The Path”. So there are certain moments that are milestones of the journey that I would like to share with my listeners, hoping that they would connect with it, Insya Allah. How were you introduced to the American Muslim> The journeys that you had with them, was that the point that solidified your passion in Islamic-spiritual songs? I was born there (US), so it is home for me. I don’t feel at home anywhere else in the world except when I’m in the United States. I think the American Muslim is relatively new to North America, United States in particular, so I think we’re on the stage of developing our culture. If you go anywhere else in the world, if you go to Malaysia, Indonesia, China, parts of Africa, every Muslim in those parts of the world have their own culture. America, are in the process of creating our own culture and in the process of ‘writing’ our own stories. And I’m hoping that this album is a contribution to that story. Was it hard to build the castle in your video clip “So Real”? Sandcastle? (laughs). I didn’t build the sandcastle. The sandcastles were built by sandcastle builders and it took the guy and his wife five hours to build it. FIVE HOURS! And we saw from beginning to end and it was incredible! He was there early in the morning, found the site and put together the sandcastle. And then, he was saying that due to the nature of sand, it would just fall apart. So he would mix water with glue and spray it so that the sand would not fall apart. It is really neat. That’s what he does, for a living, build sand castles. It was incredible, I didn’t know such people existed. Would you in the future try another genre or music style for any of your upcoming songs and/or singles? You know what, I don’t know. I like to sing whats right at the moment. I think artist, painters, musicians, whatever, they have to be true with their culture, their upbringing. I can’t sing about places that I am not from. I can’t sing with a culture that I am not part of. I mean I can, but it would not sound genuine. It wouldn’t sound real. It wouldn’t resonate, not even with me. I sound fake singing it. When crafting this album, was there a particular structure that you wanted? Was it a progression of songs or just a set of singles? During my busking days, I had written several songs and lyrics. So, when I joined Awakening Records, they gave me a whole list to choose from. So what I did, I chose those that would reflect my journey and yes, it can be said as a progression of songs. Who do you think you’ve been compared to? Maher Zain or Irfan Makki or some other singers? I never really thought of it that way. I think every artist have their own style and their own way of singing. I think a good comparison is that we all came from the same record company, Awakening Records. For example, like Mesut Kurtis, his music is totally different from mine, completely right, and it doesn’t resonate with me in the artistic sense; but the message, mission and the vision behind it is the same. And that is something we all are very proud of. What is your favorite guitar? 6-strings or 7-strings? I have always played a six string guitar. My first guitar was an Ovation and it is just the type of guitar that I have now. I’m super in love with it. I love how it looks, how it feels. It is like a member of my family. This specific one is about 6 years old. So I busk with that. I used to busk with an older ovation that I had sold. Kind of miss it actually. Do you miss your days as a software engineer? No, not as a software engineer. I was a software engineer for about a year and a half, and then I quit to became a high school teacher. I taught high school for eight years, AND that I miss. I miss connecting with young people. And for me to give up teaching to do music full time, it was a difficult decision for me. To see someone walking in class and knowing nothing and at the end of the year, they know a lot and you know thats because of the time and effort you put in and of course the barakah of Allah S.W.T. You can’t get that feeling anywhere else in the world, so I do miss teaching. Our interview ended with that last question. An affable and cool dude, we wish Raef with the best of luck, and Insya Allah we will see him far in his chosen Path.